getcalc.com's Orifice Discharge Rate Calculator is an online mechanical engineering tool for fluid mechanics to calculate the fluid's volumetric flow rate into the atmosphere through the opening of a chamber, in both US customary & metric (SI) units. 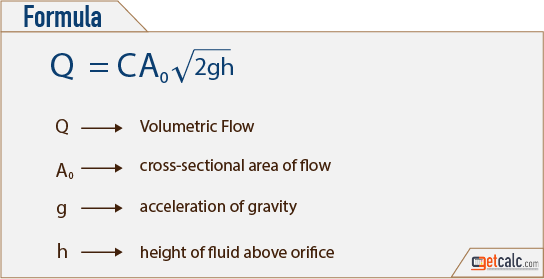 Orifice Discharge Rate is a measure of volumetric flow rate of fluid into the atmosphere trough an opening, due to gravity. In fluid mechanics, Orifice is an opening or nostrile in the body or chamber, generally provided at the bottom to discharge the fluid through it.